Good news for middle-earthfans. Bilbo and Frodo Baggins' diary, it is known as The Red Book of Westmarch, is preserved. You can see with your own eyes. This two volumed handmade book, The Tales From Middle-earth (its sub-title: Homage to Tolkien), contains the complete text of The Hobbit, the Fellowship of the Ring, the Two Towers and The Return of the King, handwritten in English by the Hungarian artist Hári Isván, which took him two and half years to do and features Bevel-Edged boards. The text of it is not only handwritten - but the illustrations are also repainted & redrawn. 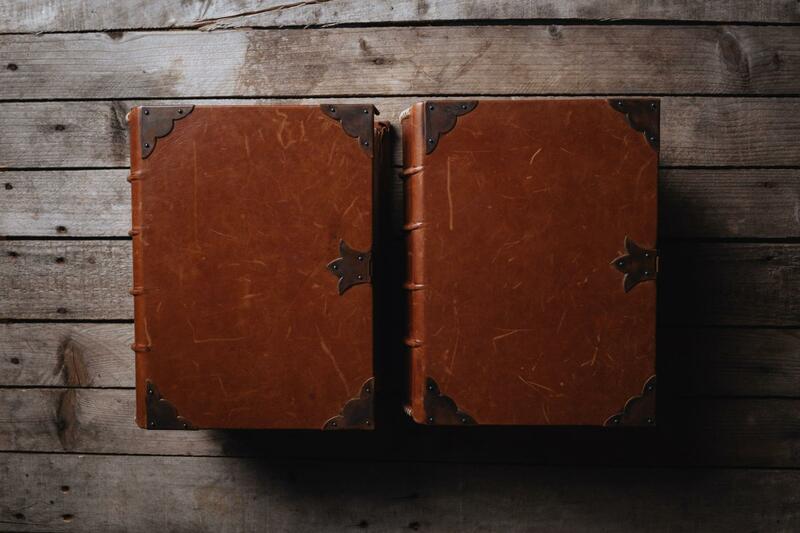 The book is leather bound (brown 'antique' color), with ornaments on the corners and clip made of copper. The book includes four paintings (Hobbiton-across-the-water, the Lord of the Eagles, Bilbo comes to Huts of the Raft-elves, the Conversation with Smaug) & eigth drawings the Trolls, the Mountain-path, The Misty Mountains looking West, The Elvenking's Gate, Lake Town, The Front Gate, The Hall at Bag-End, and the Gate of Moria), originally made by J.R.R. Tolkien. Included are also the Map of Wilderland (by Tolkien) and the Map of Middle-earth (by Shelly Sapiro). There are three special inserts: 1. the letter from Gandalf to Frodo that came to his hand too late in Bree, sealed with his ornamental 'G'-rune. 2. Thor's map and 3. the letter that was written to Bilbo by Thorin. Details: High: 20"/30 cm, length: 13"/22 cm, thickness: 8"/15cm, weight about : 8 kg. (each). It would be nice if the seller confirmed that they had permission from the Tolkien Estate to sell this. If you bought it without this permission, then may be very difficult to resell in the future. My understanding (as a complete layman in this field) is that this is a unique creation, i.e. "fine art", and does not need permission from the Estate. Just like Warhol could make a painting of a Campbell's Soup can without permission from Campbell's. The original art can be bought and sold no problem. If this artist wanted to print up a few hundred copies of his book and sell them, then he would be in violation of copyright. The original book is the first and last copy. If anybody needs a second one that must to write it down her/himself. But I produced few facsimile versions for showing how would it look like in standartized production. I send one of these to HarperCollins and though they liked it very much and it caused a lot of joy to them (I saved their letter), unfortunatelly they do not see any opportunity in this adventure. TL: Did you have permission from the Tolkien Estate to make this book? HI: No, I have got not any. Though there is a note on every "officially–made" book about needed permissions - I think, and I hope that I am right: I did not do anything for what I should have to ask anything from anybody. Look, I am not a lawyer, I only had an idea, a dream and I had to make it. It was a must. My understanding (as a complete layman in this field) is that this is a unique creation, i.e. "fine art", and does not need permission from the Estate. Just like Warhol could make a painting of a Campbell's Soup can without permission from Campbell's. Warhol was sued by Campbell's on multiple occasions and they only relented when they realized his art was free advertising so they gave him permission. In this case I suspect the artist would be sued and would lose. He has not produced a piece of art, he has reproduced a copyrighted work and added a font. The art alone is beyond question as copyright infringement. It would, of course, require the Estate to care enough to sue over something so unimportant. There is also the matter of damages, and I suspect damages awarded in a case like this would be close to zero (as the damage caused would be close to zero). If he starts selling lots of copies, the situation might be different, but as is -- I suspect common sense is going to apply for all parties. Are you able to provide any citations for Warhol having being sued by Campbell's? I can't seem to find anything (and in fact everything I have read seems to indicate that they did not ever do so). I recall however that - after the interview, i was contacted by the Tolkien Estate to get in contact with the artist. They also wanted to know how many copies were sold and asked me to remove all available copies from my website. I did so. They were not against someone making this work, but did not find selling it was an option. I did not follow up upon their conversation with the artist after that, but suppose he must have made some kind of arrangement.